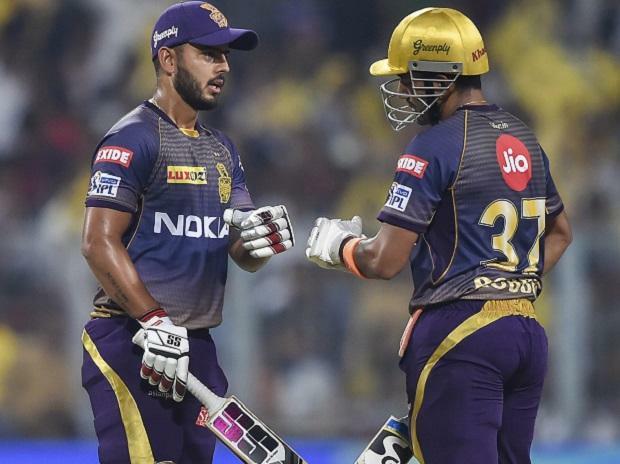 In the match 6 of VIVO Indian Premier League 2019 (IPL 2019), Kolkata Knight Riders (KKR) beat Kings XI Punjab (KXIP) by 28 runs at The Eden Gardens in Kolkata on Wednesday. Earlier, half-centuries from Nitish Rana and Robin Uthappa, and yet another blistering knock from Andre Russell helped Kolkata Knight Riders post a massive 218 for 4 against Kings XI Punjab. Russell made full use of a reprieve when he was on three to hammer five sixes and three fours in his 17-ball 48 to play a major role in KKR posting a big total. Russell, who hit a sensational 19-ball 49 against Sunrisers Hyderabad, was brilliantly yorked by Mohammed Shami. But it was adjudged a no-ball as only three KXIP fielders were inside the 30-yard-circle against a mandatory minimum of four. The Jamaican then hit top gear, smashing Andre Tye for two sixes and two fours. He then went on to hit Shami for three sixes in a row to take KKR past 200. Playing his first match after the 'Mankading' controversy, Kings XI Punjab skipper Ravichandran Ashwin found the going tough after he opted to bowl with Sunil Narine unleashing the fury early on with a nine-ball 24. Nitish Rana struck his consecutive half century, a 34-ball 67 while number 3 Robin Uthappa was their top-scorer, remaining unbeaten on a 50-ball 67 (2x6, 6x4) to lend KKR the stability. Off to a sedate start with 22 runs from 21 balls, Rana switched gear against Ashwin hitting the India off-spinner for two sixes and continued his assault on Mandeep Singh in the next over with successive sixes. Having grabbed the spotlight in the Tamil Nadu Premier League en route to fetching the joint-highest bid of Rs 8.4, Varun Chakravarthy found IPL a different ball game when Narine smashed the debutant for three sixes and a boundary in his first over. But Narine's innings (24 off nine balls) ended when South African pacer Hardus Viljoen worked up great pace and bounce to get a top-edge for his debut IPL wicket.